Annual calibration for most metrology equipment is recommended by leading manufacturers, such as Starrett in order to ensure high standard of measurement accuracy and repeatability. Accordingly, our metrology staff can help you to schedule an annual service and calibration for your optical or vision system to coincide with one of our regular visits interstate or to New Zealand in order to help reduce the travel costs associated with getting our support and service technicians to your facility. We found the service and calibration technician from Met Optix to be very professional and knowledgeable in the recent servicing of our multiple Starrett comparators on-site and now we are considering to include this as an annual event as part of our quality systems and performance improvement strategies. Our additional calibration and servicing capabilities over the coming months, as new systems are delivered into Australia and New Zealand, will be backed-up and supported by our service and support technicians who have received the appropriate factory-authorised training and skills. By entrusting your equipment calibration and servicing to a qualified and factory-endorsed technician from Met Optix you can be assured of consistently high levels of calibration performance and adherence to recognised global standards in order to protect your valuable metrology equipment and testing products. How much does calibration cost? Our calibration services for Starrett vision systems and optical comparators usually take one day to complete with our daily charge for service and calibration work currently A$640 + GST per day. Travel and accommodation expenses for interstate and overseas facilities are extra as is any additional spare parts required as part of the service / calibration process. 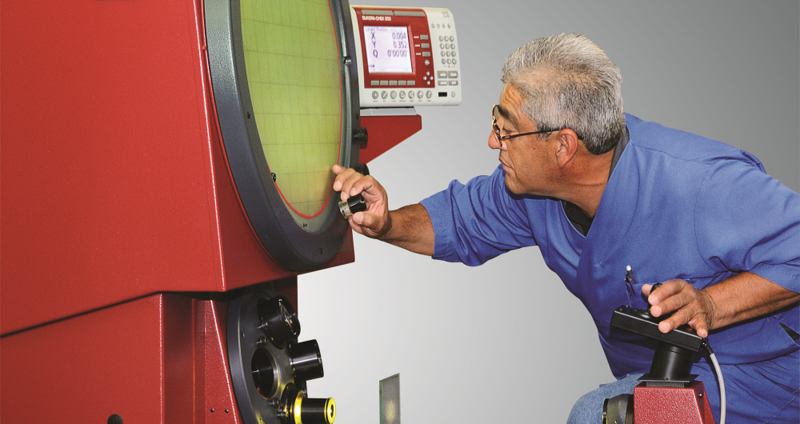 Calibration reporting, for example a Starrett vision system, consists of a seven page calibration report using NIST traceable artefacts and full factory endorsed procedures and practices conducted by our factory-trained and accredited calibration and service personnel. The reports show the linear accuracy of the X,Y and Z (if fitted) axes of movement using certified artefacts and non-linear error correction mapping again with a certified artefact. This ensures that the systems are performing to factory specifications at the specified operating temperatures with high levels of repeatability. Do I need calibration or verification for my metrology equipment? Calibration of metrology equipment can usually only be performed by the OEMs factory-trained staff or local representative as they have the ability to change the error map for the equipment by accessing the operating software. Verification, on the other hand, can be performed by suitably qualified staff with the required traceable artefacts in order to produce a report on the accuracy of the equipment to the OEM specifications. However, if the equipment is out of specification, the supplier performing the verification cannot usually bring the machine back into specification, this has to be done by calibration. If you need any more information on any of the products or services, or if you have some questions, please don’t hesitate to contact us by filling out your details in the form below and we’ll get back to you within 24 hours. Guaranteed!